Early in 1944, during the planning of the advancement of the Italian Campaign, the need for the Air Observation Post units became apparent. Originally, two units were to be formed, with No 663 Polish Squadron as one of them, which was to serve the need of the 2nd Polish Army Corps. 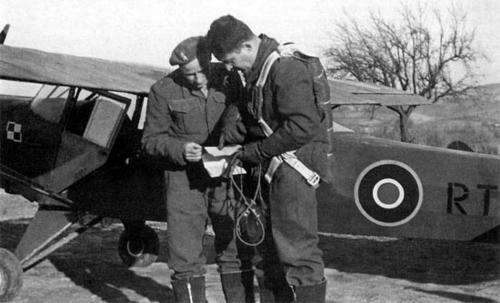 Flying unarmed aircraft, either the pilot or his passenger acted both as an observer watching for targets on the ground, or as a Forward Observation Officer directing the artillery fire by radio as well as calling in tactical ground-attack aircraft. 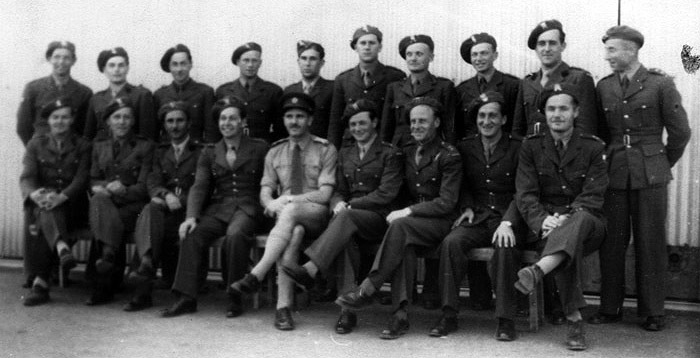 In March 1944, twenty two Polish officers were sent to pilot school in South Africa*. Since 5th July till 4th October, they went through intensive training on Tiger Months and Austers, each having flown over 100 hrs. The candidates also attended special courses in artillery ranging and observation. No flying accidents were recorded. 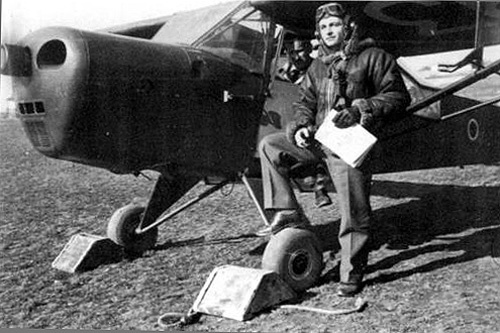 Then the group was sent to the OPU at Eboli Italy, where farther training on Austers Mk III, IV and V was scheduled. Polish artilery oficers assigned for the course in South Africa. 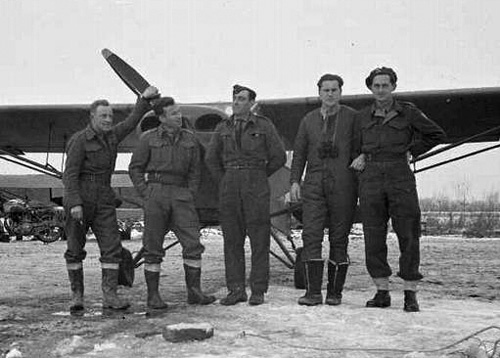 Back row (from left): Feliks Ruszala, Boleslaw Kuzminski, Adam Nowotny, Emil Skulski, Marian Stelnicki, Stanislaw Jaczyk, Jan Hryniewicz, Jan Pasnicki, Mieczyslaw Okornicki and Felicjan Perucki. 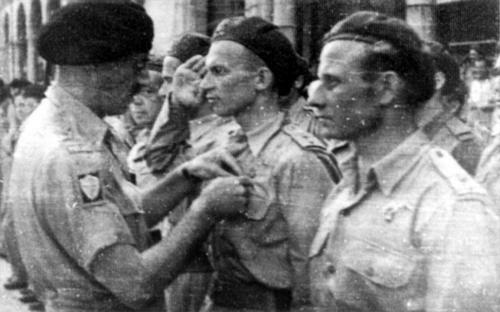 Front row: Stanislaw Wasilewski, Adam Kijowski, Bohdan Ruszczyc, Edward Pawlikowski, South Afrcian Officer, Ronald Filipowicz, Slawomir Grodzicki, Stanislaw Piotrowski and Seweryn Laskowski. (Via Wojciech Zmyslony). From left: S/Ldr Edward Pawlikowski; F/O Murzynowski (at CFS in South Africa) and F/O Skulski. The acute need for the air observation posts forced the Army Headquarters to speed up the formation process for the new unit. 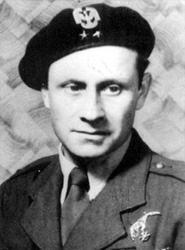 Thus, on September 8th, 1944, the C-in-C of the 2nd Polish Army Corps issued an order to immediately organize the No 663 Squadron. S/Ldr E. Pawlikowski was appointed its first O.C., having S/Ldr W. E. Wright as his British adviser. The artillery officers arrived at Eboli on 30th October. The rather complex training process lingered and the unit became operational in mid-December 1944. The Squadron was then posted to Pontecorvino to hone its operational capability and to absorb wireless operators and drivers. Underequipped, with only one third of the established aircraft strength, the unit was sent to frontline zone in January 1945. The first operational flight was made on 8th January. 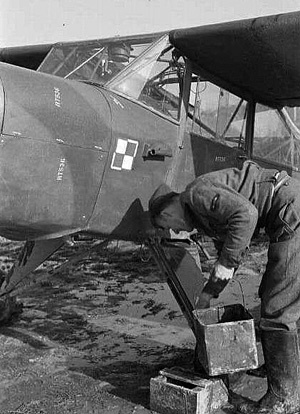 Soon after the squadron received the further equipment which was partially maintained by the ground personnel of No. 654 AOP Squadron. 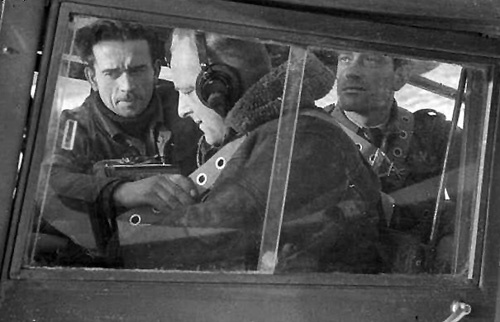 Two of the three squadron's flights began full operational service on 30th January, 1945. Flight A was still short of aircraft and its pilots flew operationally only since 7th February. On the January 23, 1945, the whole squadron was transferred to the 2nd Polish Army Corps and took part in the fighting on the Senio river. 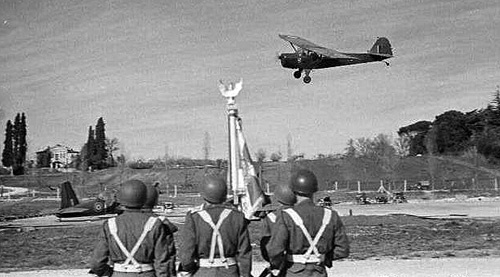 Before the Battle of Bologna commenced (April 9, 1945), pilots amassed over 500 operational flying hours, achieving great efficiency in ranging, often directing the artillery on two different targets simultaneously. 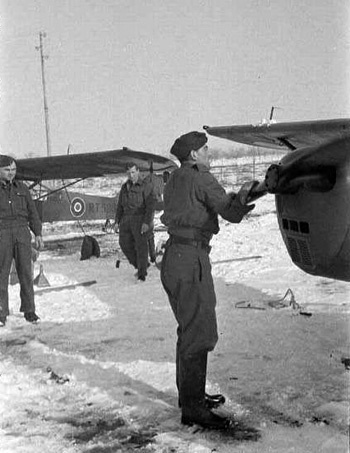 Then in just three weeks Poles recorded 504 operational flying hours and directed 258 artillery bombardments. Thanks to refined tactics of AOP units, the effectiveness of the Allies guns was greatly improved, especially in flat countryside, where the field vision was often reduced to less than 100 yards. Apart from fire ranging the 663 pilots often had to reconnoiter targets for the gunners. The squadron was withdrawn from the frontline duties on April 21, 1945. The unit's pilots flew total of 1202 operational flights (1113 flying hrs) and staggering 5150 of non-operational (5566 flying hrs). 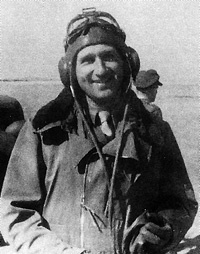 It suffered only one loss: P/O Grodzicki crashed soon after take-off (pilot's error) on April14, 1945. 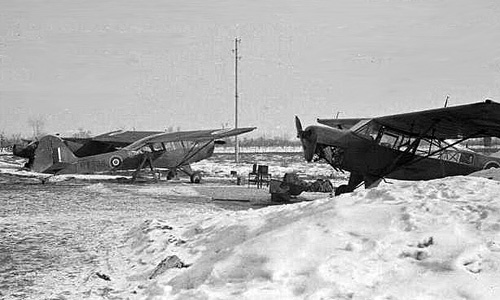 The 663 sqdn Austers dispersed somewhere in Italy. Spring 1945. 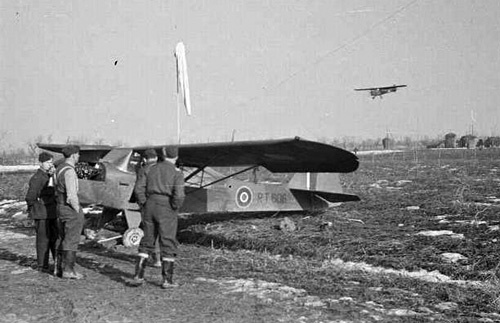 One of the unit's Austers in Italy. (Via Wojciech Zmyslony). 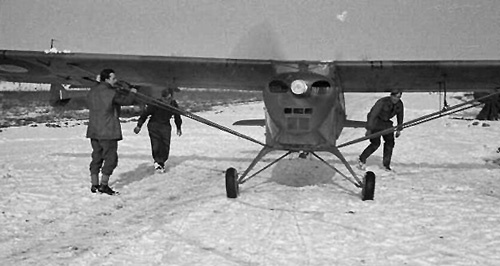 Notice the flat back parachute, different from those sat-on type used by fighter pilots. Bologna, Piazza Maggiore, June 1945. 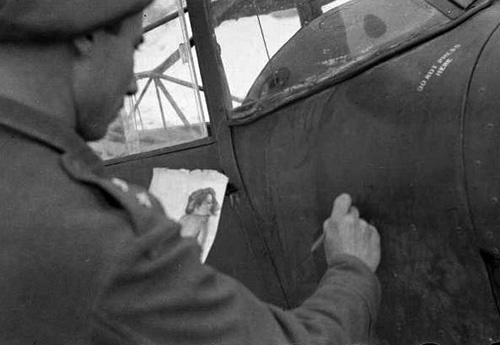 Gen. Anders decorates 663 Squadron pilots. 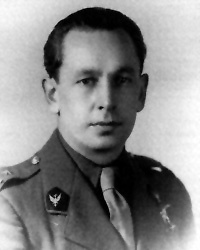 F/O Pasnicki receives Virtuti Militari. On his left is F/O Skulski. (Via Wojciech Zmyslony).